The solubility of radium nitrate in concentrated HNO3 solutions was determined. 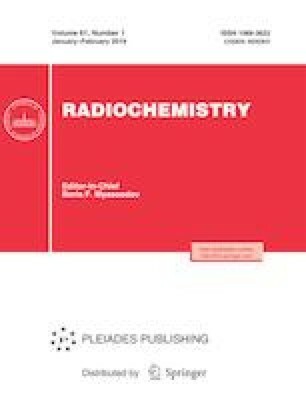 The radium nitrate solubility decreases from ∼1 × 10−3 to ∼2 × 10−5 M as the HNO3 concentration is increased from 13.5 to 22 M. The solubility of radium nitrate in the examined range of HNO3 concentrations is 3–6 times higher than the solubility of barium nitrate under similar conditions. Program for ionometric and potentiometric titration (electronic resource), URL: https://doi.org/multitest.semico.ru/titr.htm (Oct. 10, 2017).